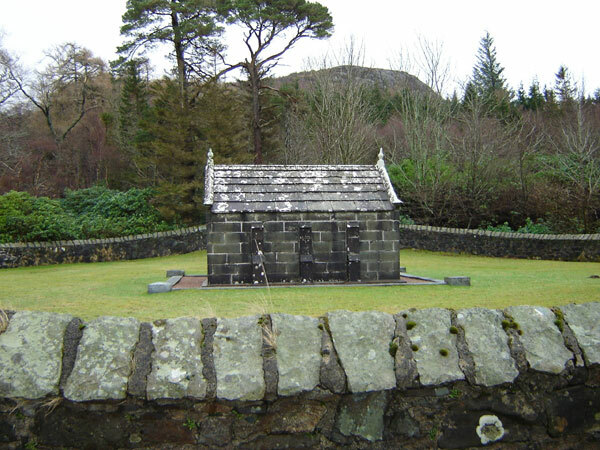 The Mausoleum lies three miles from Salen, off the B8035, and is situated about 1 km north west of Old Gruline House. Macquarie chose this site when he felt he was nearing death. He died on 29 July 1824. His widow placed a finely-carved, red granite, flat stone over the grave, but it was later placed upright in the south-eastern doorway. 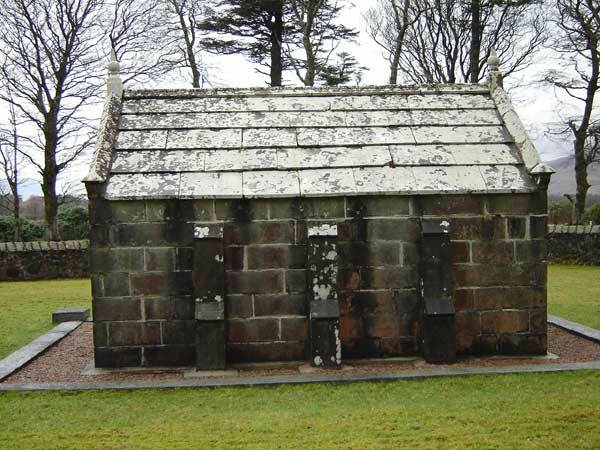 The Victorian structure is believed to have been built in 1851 ‘as a gesture by the Drummond family who successfully fought off a challenge to young Lachlan’s will by a Macquarie cousin’. 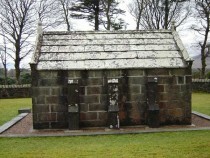 It is a plain, gable-ended structure of sandstone ashlar with buttressed side-walls and a stone-slabbed roof. The doorways are elegantly shaped with decorative finials and this likens the structure to a miniature chapel. There are two entrances, one in each gable-wall, which are sealed with marble panels. 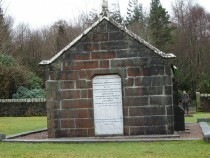 The one in the north end bears a contemporary inscription commemorating Major-General Lachlan Macquarie of Jarvisfield and his second wife Elisabeth, daughter of John Campbell of Airds, who died in 1835. The one in the south wall records Macquarie’s achievements as Governor of New South Wales, Australia. He is remembered as the ‘Father of Australia’. Macquarie was born in 1761 on Ulva of farming parents. He joined the army, eventually became a Major-General, and was Governor-General of New South Wales between 1809 and 1820. While he was in Australia he opened up the whole of the eastern seaboard, where many place names derive from his family and from Mull. Helped by his wife, he brought a new humanity into the convict settlements. It is even reported that desperate people would commit minor crimes so as to be transported to a new and better life in New South Wales. Unfortunately, Macquarie had influential political enemies, both in London and Australia, who were jealous of his achievements and opposed his advancement. As a result, he was Governor-General for only eleven years. He founded the village of Salen in 1808.